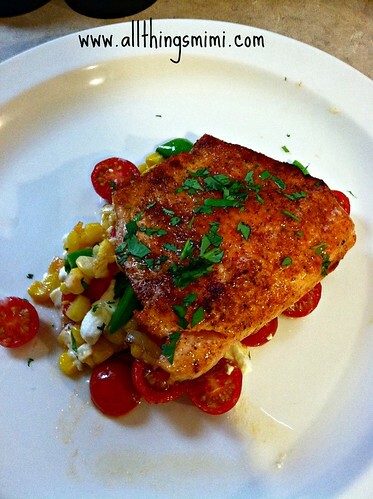 blackened steelhead on corn salad, originally uploaded by All Things Mimi. So for this super quick dinner, I made a quick corn salad by cutting the kernels from 2 ears of fresh corn and sauteing it with some Vidalia onion. After a few minutes I added some halved grape tomatoes and turned off the heat. Then I crumbled in a handful of feta cheese. For the fish, I took 2 pieces of steelhead trout, and seasoned them with Zatarain's Blackening Seasoning. I quickly pan-seared them and served them on a bed of the corn salad.